Obama wants to push states away from coal—but if they turn to natural gas, the climate problem could get even worse. There’s little doubt the Obama administration’s big push to cut carbon pollution, announced this week, will lead to much less coal-fired power in the United States. That’s a good thing. But what if states instead turn to natural gas-powered electricity instead? That’s certainly what the administration would like them to do—it’s explicitly laid out as an alternative in the Environmental Protection Agency’s proposed rule, and Obama echoed that suggestion when he spoke on a conference call the day the rule was unveiled. For years, his administration has pushed natural gas as a fundamental part of America’s long-term energy strategy. If that happens, it could be a disaster for the environment, according to some leading climate experts. Federal regulations on the extraction and transport of natural gas range from insufficient to nonexistent, and the resultant methane emissions from a bigger natural gas boom could neutralize the gains made by the EPA’s rule, and possibly even accelerate climate change in the short-term. There are, it should be noted, significant reasons that natural gas might not become an energy source of the future, according to some analysts—but any turn away from gas will be thanks to volatile market dynamics, and not an administration heavily pushing its use. How does the “Clean Power Plan” work? Then EPA regulators give each state a carbon intensity goal for 2030, and each state has a different goal based on what the EPA thinks it should be able to achieve. When you assume all forty-nine goals are met by 2030, the overall outcome is the projected 30 percent reduction of carbon pollution from 2005 levels. States have many options to reduce carbon intensity. The EPA rule lays out four suggestions: making coal plants more efficient, boosting energy efficiency in the state, increasing wind, solar and nuclear power—and expanding natural gas power production. States can do some, all or none of those things. They are also free to come up with their own plans, like introducing a carbon tax or a cap-and-trade scheme. For companies like Exxon Mobil, Chesapeake Energy and Anadarko Petroleum—all leading producers of natural gas—the EPA plan might be a huge boon, as states begin rapidly expanding natural gas production to meet the new carbon intensity standards. America’s Natural Gas Alliance, which represents these and other major natural gas producers, estimated this week the regulations could increase the energy sector’s daily gas demand by 10 billion cubic feet per day, up from the current demand of 22 billion cubic feet—an astonishing 50 percent increase. The critical problem is that the proposed EPA rule is concerned only with the carbon emissions from burning fossil fuels at power plants—not the extraction, or transport, of those fuels. It’s true that burning natural gas for electricity generates half the carbon pollution as coal, and that’s where the EPA stops its analysis. But getting natural gas out of the ground and to the power plant creates massive methane leaks—and methane is a kind of super-greenhouse gas that is over thirty times more potent than carbon dioxide. “Substituting in natural gas for coal I think is disastrous idea,” said Robert Howarth, a professor of ecology and environmental biology at Cornell who authored a leading study on the climate effects of natural gas emissions. He believes that converting to natural gas power plants will actually make climate change worse, not better. A joint study by researchers at Stanford, the Massachussetts Institute of Technology and the Department of Energy found that methane leaks from natural gas extraction and transport actually negate the climate impact of switching to natural gas-powered vehicles. It did find that switching to natural gas from coal for power plants still resulted in fewer overall carbon emissions even considering the leaks, but the climate impact of the switch was heavily moderated. 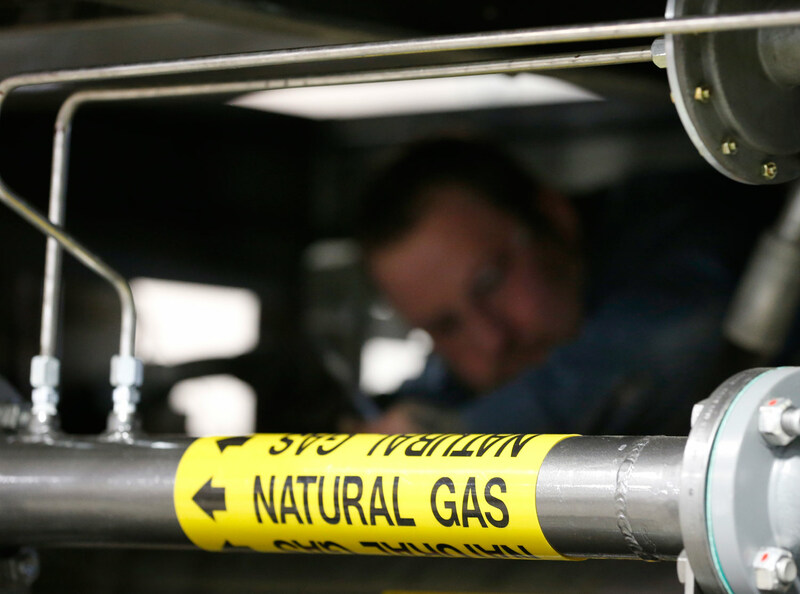 The EPA itself estimates natural gas systems are the second-leading source of methane emissions in the United States, and an expanded natural gas boom could exacerbate the problem. Leaks occur first at the wellhead, where the natural gas comes out of the ground—think of the air that sprays out when you go to pump up a bicycle tire. The Obama administration has actually moved to regulate fugitive emissions there, though environmentalists say there are too many loopholes. Aside from lax regulations, the EPA consistently underestimates the volume and the danger of methane, according to many experts. A November 2013 study in the Proceedings of the National Academy of Sciences found the EPA was underestimating methane emissions by as much as 50 percent. The EPA may also be low-balling the potency of methane. The official agency estimate is that methane is twenty-one times more potent than carbon dioxide over a 100-year period, though the EPA will soon switch to a standard of twenty-five times more potent. But the Intergovernmental Panel on Climate Change uses a standard of 34 percent more potent. The White House did announce in March that it is studying how to implement a comprehensive methane strategy, and some environmentalists are actually fairly optimistic it could be an aggressive one. But Howarth worries nothing can practically be done to contain pipeline leaks anytime soon—except putting far less gas through them. But will natural gas defeat itself? The Obama administration—and likely any future administration, Democratic or Republican—is unlikely to also push for less natural gas usage. But market experts predict it could happen anyway, which would bail us out from the worst effects of methane emissions. “I don’t think that the rule necessarily guarantees a much larger footprint for natural gas, because there’s a bunch of other variables that are going to be determining that,” said Tyson Slocum, director of Public Citizen’s energy program. Essentially, he believes natural gas might not remain as cheap as it is today, and will thus become an unattractive alternative. Natural gas prices skyrocketed during the extreme cold weather this past winter, for example. “That definitely sent alarm bells throughout power markets that natural gas is not automatically cheap if you’ve got significant events or significant demand stresses on the system,” Slocum noted. Another problem is the uncertain productivity of fracked oil and gas wells. Industry likes to claim they will provide plentiful, cheap gas for at least 100 years, but recent results undercut that claim—newly drilled wells do fine, but then suddenly the production drops off. The average flow from a shale gas well drops as much as 75 percent in the first year. “If that is sustained in these formations, you could see drops in production that return us back to the days when there was closer matches between supply and demand, which had an upward pressure on prices,” said Slocum. That would be good for the environment—but not much to the credit of a government actively trying to encourage extensive natural gas use.